I've been working on recently so, I'll use this as a bit of an introductory. The air shook with the sound of wings, powerful and strong. Destial leapt up, slipping slightly on the mound of golden trinkets. 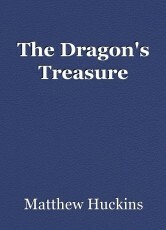 He scrambled down as fast as he could to see the enormous dragon land heavily on the floor of the cave. He didn't shy away in fear, even though he was much smaller than the enormous dragon. The dragon bent its neck precariously to stare down at Destial. His eyes narrowed. He leaned forward even further, sniffing deeply. He suddenly straightened up in rage. I smell paper. You’ve been stealing books again haven’t you? Not knowing what it meant to lie, Destial bowed his head in shame. The dragon roared in fury and ranted on about how a young dragon should not be concerning themselves with the works of humans. Humans are only good for keeping us from going hungry. The dragon snorted angrily, then tossed the smaller dragon aside. Destial’s body slammed into the wall of the cave, and for a second, his human flesh rippled with scales and muscle. The larger dragon glared down at him furiously. You will not speak to me like that again, understand? Destial nodded, then ran off to a tunnel leading to deeper, colder part of the cave. He lit a candle, with human tools, since he could not breathe fire, unlike his father, who was feared for burning down whole kingdoms. As he raised the candle up, the piles of books he had stolen almost glimmered in the light in his eyes. Each one was knowledge, an escape, a friend. He heard his father rumble angrily, then shift himself down on the pile of treasures. Destial busied himself with his books until a strange noise caught his attention. He cautiously stuck his nose out of his tunnel, and then the rest of his face. There, at the entrance, was human, dressed in metal. Destial glanced back and forth between the human and his father, and panic rose up in his chest. If his father woke up, the human wouldn’t stand a chance, but if he showed himself, he might not stand a chance either. The human seemed to finally notice him, and he ran over quietly. A strange feeling rose up in Destial’s chest. Out? The only times he had done that was to steal more books. Destial just sat there, thinking, when he scrambled back in horror as the claws of his father closed around the knight. Destial ran back to his books and practically threw himself into one of the stories. Reading the lines over and over again, chanting them in his mind. He glanced around at his books once he calmed down. He then turned to stare out his tunnel at the gold. The books were far more valuable. © Copyright 2019 Matthew Huckins. All rights reserved. Isn't that the truth.....a good read is priceless. Nicely done piece of flash fiction.